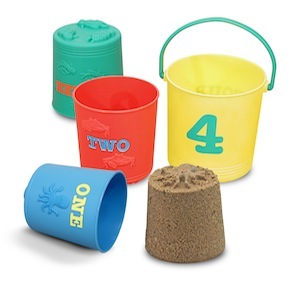 The Melissa & Doug - Nesting Sand Pails are the perfect beach toys for kids 2+ years old. 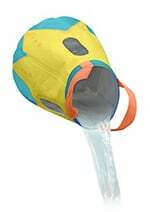 With these beach pails kids can count, mold, and nest. Count the critters molded on the bottom of each sand pail or fill each beach pail with sand and decorate the beach with starfish, turtles, crabs and octopi! After playtime at the beach or sandbox is over, the pails can be nestled together and carried home with the sturdy sea-green handle. These Melissa & Doug toys are also great for sand or water play at either the beach or indoors at your very own sand table. Filling and lifting these pails can be a calming activity for those who benefit from lifting heavy objects, which directly impacts muscles and joints.